We are proud to say that we manufacture a variety of Automatic Form Sealing Machine that can be used to pack paste and liquid. Our machines are well known for their quality and durability. Our machines are capable of working for long hour without any break. 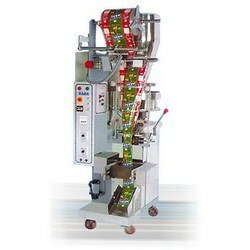 These machines are suitable for packing ketchup, edible oil, shampoo and so on. Our company works continuously to upgrade our core competencies and present to our customers, machines that are in used with modern techniques. We plan to harness our capabilities to lead the way to a better tomorrow with latest machines that help in faster production. Our personnel understand the needs and requirements of our customers and device strategies that work for the mutual benefit of all. We are one of the leading manufacturer, exporter and supplier of Weighmetric Filling Systems, Volumetric Cup Filling Systems, Automatic Form Fill & Seal Machines, Semi Automatic Pouch Filling Machine, Automatic Sealing Machines, Nitrogen Flushing Sealing Machine, Automatic Form Sealing Machine, Semi Automatic Sealing Machine, Flexible Packaging Machine, Single Chamber Vaccum Packaging Machine, Semi Automatic Vacuumizing Machine, Liquid Pouch Packaging Machine, Automatic Collar Type Machine and Multihead Weigher Machine.